3rd grade curriculum is very different from the earlier grades where the focus has always been on creating the foundation with very elementary worksheets. 3rd grade signifies a prominent shift from the regular fare of practice and imbibing to applying and solving. 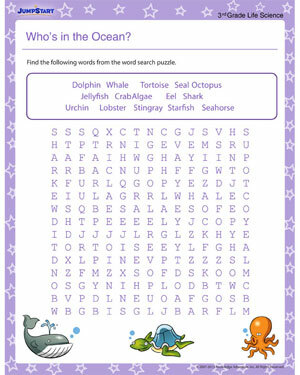 Encourage kids to explore the ocean life with this simple word search puzzle that contains some very common names of ocean animals.